Of course, another half of the reason to bring the tykes into the world is to relive some of the very same glory days. Amidst the countless assertions that disco is dead, all we can do is fight against such an ignoble fate for as awesome a decade as it had been. And, it’s pretty evident that the world is asking us to do it. Dozens of our favorite comedies make clear reference to the spectacular days, the styling threads, the grand colors, the peace and good will that came from a community ready to do little more than give a brand new meaning to being chill. Fortunately, now, you can do both at once. 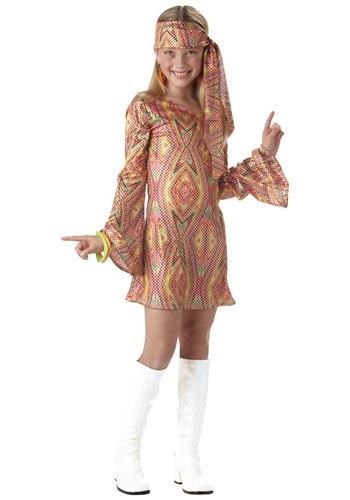 Relive some of your own best memories and bring the ‘70s right up into the modern day by transforming your kiddo into the true dancing queen with this Child Disco Girl Costume. Bright polyester interlock knit fabric makes for a comfortable base for this bright geometric print dress with shining silver sequins spangled throughout. The long-sleeves flare out to match the hemline and give you the perfect dancing edge. Add the matching head scarf to the look and she’ll be like a mirror into the past. Complete the look with any of our optional high book accessories and this little dancing queen will own the disco stage.